Now Available! Click here to purchase. Even years after they graduate, students of beloved teacher Tom Doelger marvel at how lessons learned from his English classrooms, Quest trips, and memorable baccalaureate addresses continue to inspire and direct their lives. 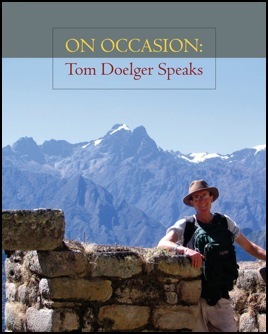 In this new book, On Occasion: Tom Doelger Speaks, you will find a collection of the essays that epitomize just why, when he speaks, so many listen.